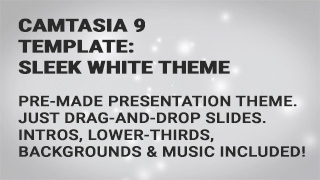 Sleek White Theme is a Camtasia 9 (PC) template collection with a lot of matching resources included. The idea behind this collection is to speed up the process of creating professional video presentations, and bypass for example PowerPoint in the process. 6x Text Slides with Headline, Sub-headline etc.